Scanning colour negatives can be a challenge, the orange mask can seriously interfere with a scan and not all scans look or feel right straight off. Scanner software can do a good job of automatically balancing out the orange mask but the verity and differences these masks make can still leave colour casts. 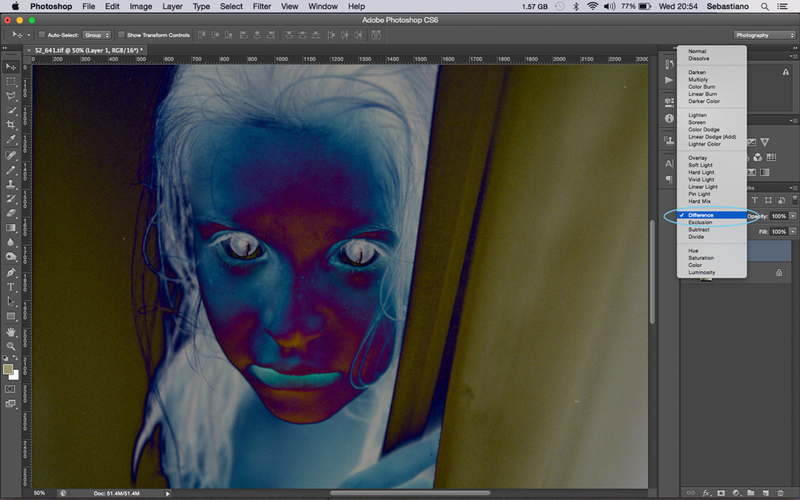 These, therefore, need to be manually removed and so a degree of colour correction is often required. After scanning this frame of Kodak Portra 800 with an Epson v500 at 2400dpi and saving as a TIFF file using Epson Scan software, the scan appeared to me too warm/yellow and not how I recall. Skin is a key colour in any portrait and can be used as a powerful colour control. For me, a good starting point for any colour correction is to find mid grey and these are the steps that I use to do it with Photoshop CS6. • Start by adding a new layer above the background layer. • Next fill this new empty layer with 50% grey by selecting Edit>Fill. In the pop out window use the dropdown menu to select 50% Grey. • The new layer will now fill 50% grey. From the blend mode dropdown menu set the grey layer to Difference. Difference blend mode works by comparing 50% grey with the image below it and by looking for differences between them. Areas in the layer which are different from the picture below it show up as in unnatural yellows, purples and blues, but any areas which are the same between the layers show up as black. In other words, by using Difference blend mode, the areas which are not different become the darkest parts of the image, and can be used to locate any areas that closest to mid grey. • Finding the mid grey areas is now as easy as finding the darkest part of the Difference layer. To do this add a new Threshold adjustment layer. With the Threshold window open move the arrow under the histogram to the far left i.e from 128 to 1 the image will go from black to white. • Now by slowly moving the arrow back to the right gradually small areas of black pixels will appear on the white background. These areas are the areas of the image closest to mid grey. • Select the colour sample tool from the eyedropper fly out tool panel and by zooming in close to the black pixel areas use the colour sample tool target a black pixel zone. • Next add a Levels adjustment layer and toggle off the Threshold and Difference layers by clicking on the eyes to their left. The colour sample tool target will still be visible and this is the exact area should be targeted by the set grey point eyedropper from the layers window. • With the set grey point eyedropper selected, click directly on the target. All colours will now be neutralised based on this mid grey pixel, effectively colour correcting the image. 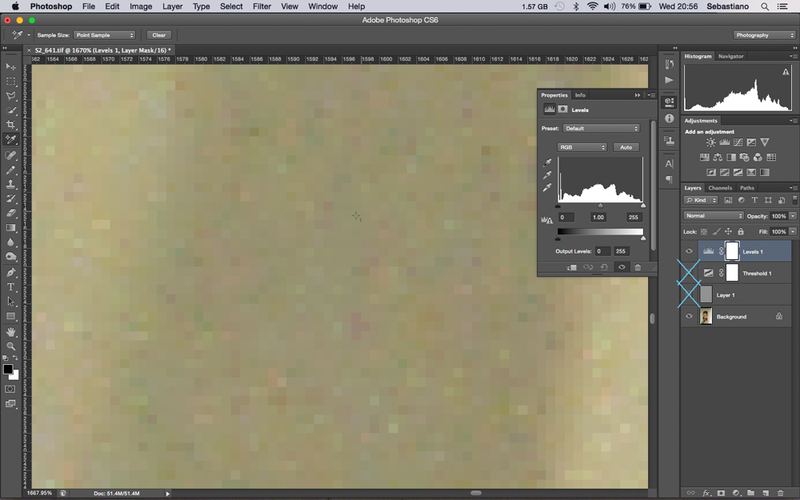 It is further possible by using the opacity slider to get additional fine colour control. • Finally clear the target and delete the Difference and Threshold layers.